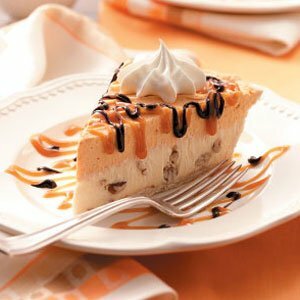 Spread ice cream into the crust; freeze for 2 hours or until firm. In a small bowl, combine the pumpkin, sugar, cinnamon, ginger and nutmeg; fold in whipped cream. Spread over ice cream. Cover and freeze for 2 hours or until firm. Remove from the freezer 15 minutes before slicing. Drizzle with caramel ice cream topping. Drizzle with chocolate ice cream topping if desired. Dollop with whipped cream. Makes 8 servings. .